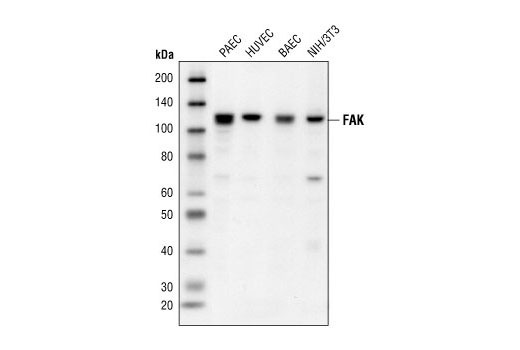 Western blot analysis of extracts from various cell lines, using FAK Antibody. Western blot analysis of extracts from various cell lines using Paxillin (D9G12) Rabbit mAb. The 45 kDa band is a degradation product of full-length paxillin protein. 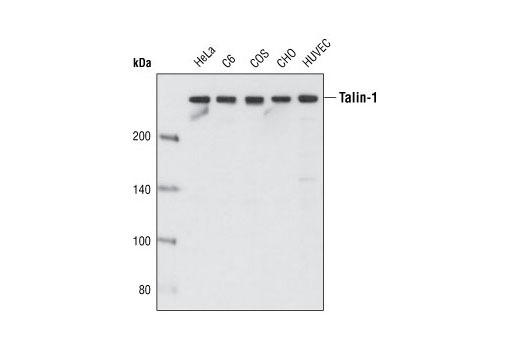 Western blot analysis of extracts from various cell types using Talin-1 (C45F1) Rabbit mAb. 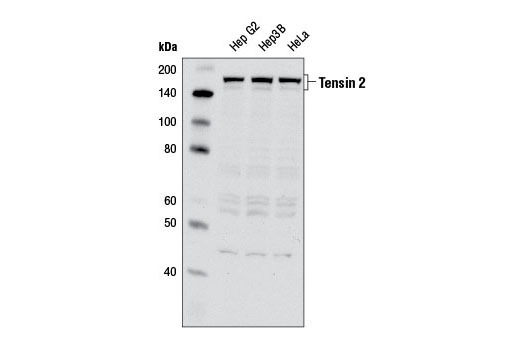 Western blot analysis of extracts from various cell lines using Tensin 2 Antibody. 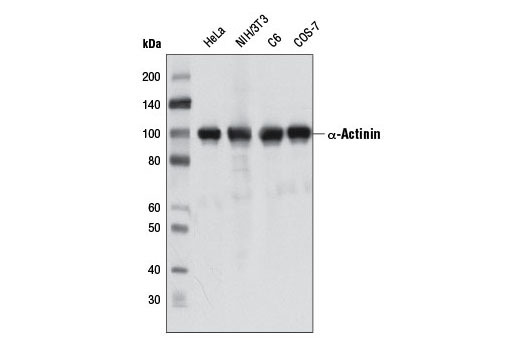 Western blot analysis of extracts from various cell and tissue types using Vinculin Antibody. 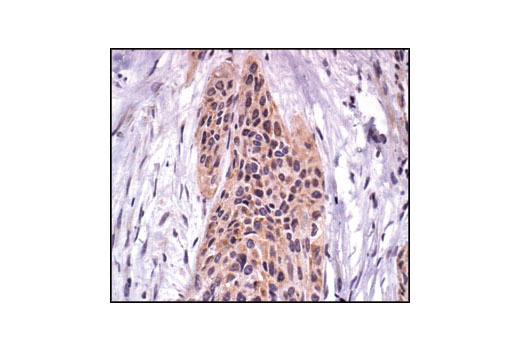 Immunohistochemical analysis of paraffin-embedded human breast carcinoma, using FAK Antibody. 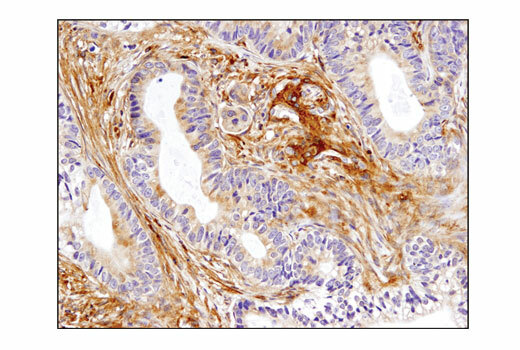 Immunohistochemical analysis of paraffin-embedded human colon carcinoma using Talin-1 (C45F1) Rabbit mAb. 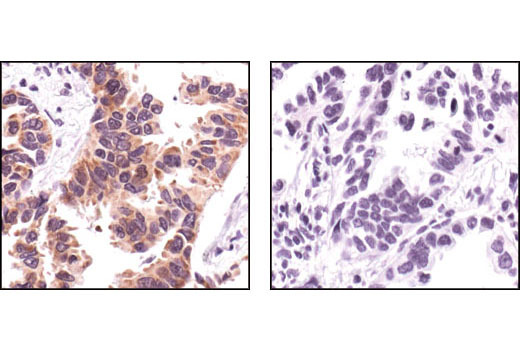 Immunohistochemical analysis of paraffin-embedded human lung carcinoma, using FAK Antibody in thre presence of control peptide (left) or antigen-specific peptide (right). 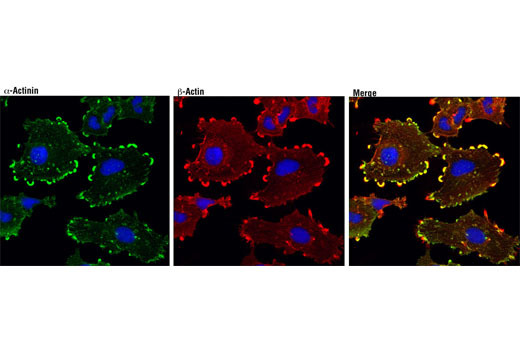 The Focal Adhesion Protein Antibody Sampler Kit provides an economical means to evaluate proteins involved in focal adhesions. 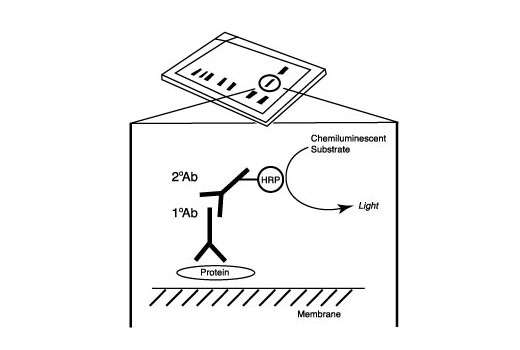 The kit includes enough antibody to perform two western blot experiments per primary antibody. Each antibody in this kit recognizes endogenous total levels of its specific target protein. 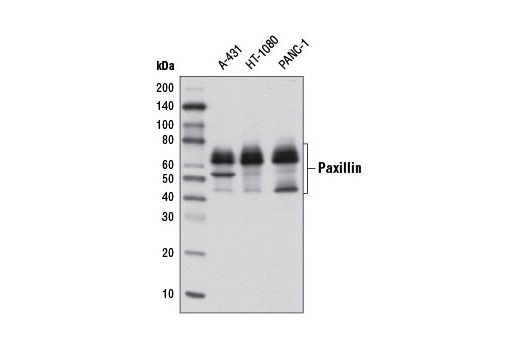 Paxillin (D9G12) Rabbit mAb recognizes endogenous levels of total paxillin protein and recognizes all human paxillin isoforms. 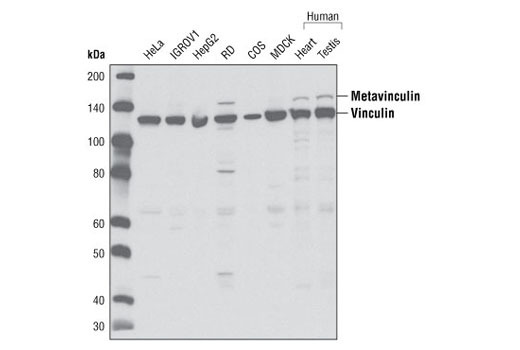 Vinculin Antibody detects endogenous levels of total vinculin protein and also reacts with metavinculin, a 145 kDa splice variant of vinculin. Monoclonal antibodies are produced by immunizing animals with a synthetic peptide corresponding to residues surrounding Phe316 of human α-actinin protein, surrounding Lys193 of human paxillin protein, and near the carboxy terminus of human talin-1 protein. Polyclonal antibodies are produced by immunizing animals with a synthetic peptide corresponding to residues surrounding Glu710 of human FAK protein, surrounding Arg1555 of human tensin 2 protein, and residues near the amino terminus of human vinculin protein. Polyclonal antibodies are purified by Protein A and peptide affinity chromatography. Focal adhesions connect the cytoskeleton with the extracellular matrix (ECM), a complex structure of secreted macromolecules that surrounds mammalian organs and tissues. Integrins clustered on the extracellular side of focal adhesions relay signals from the ECM to intracellular protein complexes that signal the actin cytoskeleton to regulate tension for cell motility. Internal signals converge on focal adhesions to regulate integrin receptor affinity and avidity. Signaling through focal adhesions regulates cell adhesion, migration, proliferation, apoptosis, and gene expression, and impacts cellular processes such as development, wound healing, immune response, invasion, metastasis and angiogenesis (reviewed in 1-3). Focal adhesion kinase (FAK) is a widely expressed cytoplasmic protein tyrosine kinase involved in integrin-mediated signal transduction. Integrin clustering triggers FAK recruitment to the focal adhesion complex (4). Talin is a large, multidomain focal adhesion protein that interacts with the intracellular domains of integrins and other focal adhesion proteins. Talin is involved in the formation of focal adhesions and in linking focal adhesions to the actin cytoskeleton (5). Paxillin is a key component of integrin signaling that localizes primarily to focal adhesion sites in the extracellular matrix (6). Tyrosine phosphorylation of paxillin is required for integrin-mediated cytoskeletal reorganization (7). Paxillin is phosphorylated by FAK at Tyr118 (8,9). Vinculin is a cytoskeletal protein involved in regulation of focal adhesions and embryonic development (10-13). Active vinculin translocates to focal adhesions where it may be involved in anchoring F-actin to the membrane and regulating cell migration. Vinculin binds a number of proteins, including talin, α-actinin and paxillin (11,13). Tensin 2 localizes to focal adhesions of various tissues and exhibits highest expression in heart, kidney, and liver (14,15). Tensin 2 belongs to a family of cytoskeletal proteins that include Tensin 1-3 and Cten, which couple integrins to the actin cytoskeleton (16). Tensin family proteins play an important role in signal transduction, cell proliferation, and motility (17-20). α-actinin is a member of the spectrin family of cytoskeletal proteins that was first recognized as an actin cross-linking protein, but also interacts with a large number of cytoskeletal signaling proteins, including those involved in cellular adhesion, migration, and immune cell targeting (21). Burridge, K. et al. (1988) Annu Rev Cell Biol 4, 487-525. Parsons, J.T. et al. (2000) Oncogene 19, 5606-13. Izard, T. et al. (2004) Nature 427, 171-5. Calderwood, D.A. et al. (2000) J Biol Chem 275, 22607-10. Humphries, J.D. et al. (2007) J Cell Biol 179, 1043-57.
ffrench-Constant, C. and Colognato, H. (2004) Trends Cell Biol 14, 678-86. Witt, S. et al. (2004) J Biol Chem 279, 31533-43. Xu, W. et al. (1998) Development 125, 327-37. Nayal, A. et al. (2004) Curr Opin Cell Biol 16, 94-8. Turner, C.E. (2000) J Cell Sci 113 Pt 23, 4139-40. Burridge, K. et al. (1992) J Cell Biol 119, 893-903. Bellis, S.L. et al. (1995) J Biol Chem 270, 17437-41. Bellis, S.L. et al. (1997) Biochem J 325 ( Pt 2), 375-81. Clark, K. et al. (2010) J Cell Biochem 109, 808-17. Hafizi, S. et al. (2002) Biochem Biophys Res Commun 299, 793-800. Lo, S.H. et al. (1994) Bioessays 16, 817-23. Lo, S.H. et al. (1994) J Cell Biol 125, 1067-75. Chen, H. and Lo, S.H. (2003) Biochem J 370, 1039-45. Katz, M. et al. (2007) Nat Cell Biol 9, 961-9. Chen, H. et al. (2002) Proc Natl Acad Sci U S A 99, 733-8.